Color: Mix of pastel shades of pink, creamy yellow, bicolor combinations, plus some ruby blooms. 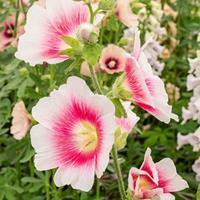 This disease resistant cottage garden favorite blooms in a seemingly never ending display, for the large saucer-shaped flowers open in succession from the bottom up. Providing a strong vertical accent in gardens, they look great supported by a picket fence or against a shed. Stake if growing in windy areas and space well apart to increase air circulation and avoid disease. 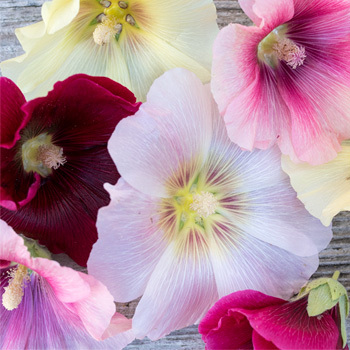 Encourage its perennial tendencies by cutting back after bloom and by planting in areas where the soils are fertile and very well-drained. Self sows. Plant: A base of foliage the first year, followed by tall flower stems the second year with lobed, somewhat rough green leaves that become smaller going up the flower stems. May bloom in its first year, especially if started late winter indoors. 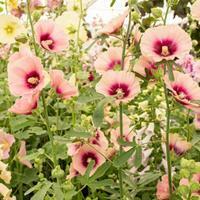 Flowering: Pastel saucer-shaped flowers along the stems blooming from the bottom to the top in succession.